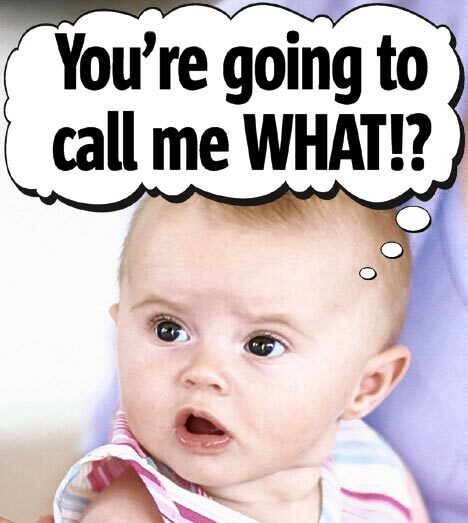 Choosing a baby name is not always easy. Husbands, you have reached the final stage of the pregnancy marathon! The last three months of pregnancy can be called the months of mass destruction. The pregnant wife will be fond of knowing the baby’s gender; you too, of course. She will start shopping for the baby. She will have emotional “alterations” — in some cases, depression! Wife: That doctor is really weird. She is telling us “may be a boy, may be a girl.” What does she mean that the baby can be a girl? I want a baby boy, and all my friends and family are prepared for that. If we had gone to a male doctor from the beginning, he would have told us, easily, whether the baby is a girl or a boy. Wife: Huh! I need to think about baby girl names. What you do think? Layla, Dalia, or Du`aa’? or let’s call her after my close friend. You know, I want her name to be unique — something that combines Arab, Egyptian, Western, Islamic, and Pharaonic cultures all in one name! Husband: (teasing her) Don’t worry about the name. we’ll give her the name “Saffron.” I’ll complete all the official paperwork before you leave the operation room after delivery. Wife: WHAT? Saf … what? No, please. Let me choose her name. I want to name her after my mom, your mom, or your sister — just don’t choose that name. Of course, the name choice argument will give you some power to control her mood, but remember, don’t use it too much ; otherwise, you will find yourself flying out of the window! Various researches describe this month in different ways, but they all agree that the pregnant woman wants to buy the entire world for her baby. She will feel jealous if she knows or hears about other mothers buying something for their babies, and she will do her best to buy the same or better. You as a husband have to accept that and get prepared to spend your savings on it. Husbands, never ever dream of saying “no” or complaining if she asks for baby shopping. Wife: My colleague came to work with her baby today, and the baby wore a very sweet, pretty outfit that made her look like a princess. In the evening, I’ll go shopping. Husband: OK! We can shop at the weekend. Wife: Thank you, honey. I knew you would agree, so today I bought fancy brand-name clothes for her from that famous store. Our daughter must get the best! Husband: I thought we were going to do the shopping together. Wife: Don’t worry. There’s still a lot to buy. Hey, see this is a shampoo for the baby when she sleeps and that shampoo is for when she wakes up. These are diapers from the US, and this is a brush for her hair. Husband: WHAT? Shampoo for what? How do you know that the baby wants to sleep or not to and how to decide ahead of time which shampoo to use? You might bathe her with shampoo used for waking up and then she will want to sleep… oh yes, then you’ll wake her up quickly and give her a shower with the right shampoo? Who told you that the baby will be born with hair; as I understand it, a lot of babies are born without any hair, so that hairbrush is useless. In addition, why did you buy diapers made in the US? What’s wrong with the ones made in Egypt? It’s just a diaper, not a fancy thing! Wife: Arrrgh! Don’t worry, babies know the right shampoo! She’ll sense which is the correct one and then act accordingly; that’s what’s written on the bottle. And I got the US-made diapers because I want my daughter to feel unique. Anyway, I bought three towels for the baby, one to use after shower, the second to dry her as the first one will be wet, and the third to cover her the second we are sure she is properly dried. Also, I got her hair clips, skin cream — one for night and the other for the morning, three pair of shoes, socks, underwear, and four dresses. Husband: Are you sure you’re shopping for a baby, not a girl who is getting ready for marriage?! By the way, did you buy her a make-up box? There’s something especially for babies. You have to run to buy it now, and don’t forget the baby’s teeth brush, too! Wife: Oh my God! You’re right, I really forgot that. I’ll arrange with my mom and sister to go out with me to complete my shopping. Wife: By the way, you have to be more careful; my close friend told me that anger and nervousness are not good for pregnancy. Today at the meeting, all my colleagues were perfectly behaved; once any one just thought about arguing with me, I told them that I was in the eighth month and the baby would be delivered prematurely if I argue! There were no arguments, and the meeting ended in 10 minutes! Husband: I think you’ll get fired soon. Days pass slowly, and the pregnant wife returns home with many things she bought from different stores. The husband gets used to seeing his wife sitting on the floor and spreading all the baby’s stuff around her to check, kiss, hug them and find out what is missing! Husbands, congratulations! You’re in the ninth month. You have waited eight months to reach that final month. You controlled your temper throughout, you worked and helped with the housework, And you are tired; you deserve some relaxation. The pregnant wife knows that the time of her being spoiled will end; finally, she will be responsible for a baby, so she will start acting as poorly, trying to show you that she is weak and powerless. Do understand that she is worried about delivering her baby — it is her first time, and she knows virtually nothing about giving birth. So you will have to –be, even more, patient! Wife: Honey, I feel sorry for you! The past eight months have been very hard for you. I rarely cooked and you stopped eating dinner, while your breakfast was just a cake; you lost 20 kg. I have to cook today. I’ll make a surprise for you. I’ll boil some eggs and prepare white cheese, but would you please prepare the salad for us?! Wife: Do you think I’ll deliver the baby naturally or will there be a C-section? You know, most of my pregnant friends had a cesarean. Maybe my doctor will deliver it naturally as she is a female doctor. Husband: Ah yep, but the doctor’s gender doesn’t affect the type of delivery. Wife: Anyway, I prepared two suite cases for the baby and me. A natural phenomenon: All pregnant women become nice and kind to their husbands just a few days before giving birth. So be careful, because that kindness will turn to hell if you were at work while she starts labor. Wife: OHHH, HELP! Mom, Father, Brother, Sister, Uncles, Aunts, United Nations, Egyptian people, the Universe, … any one! Help me, I’m in pain! The baby! Wife: (addressing her husband) Honey, I’m in pain, tell that doctor to give me any painkiller. I can’t handle it any more. I feel weak. Promise me if anything happens to me, never ever get married again! Don’t give our baby a stepmother. Please, promise me! Husband: You’ll be fine, and everything will be OK. It happens to all women; you’re not the first one. Just a few minutes from now, and you’ll hold in your arms a sweet baby girl. Wife: Did you bring a video camera with you? Don’t take any shots from my left-hand side; my right side is more photogenic! Choose good angles for the shots, I want to look pretty in the video. Take shots while I’m not screaming and before my face appears in the video screen, just tell me to smile. Husband: We’re recording the birth of our baby, not making a movie! You’ll be in the operation room, and you won’t care about anything of that sort. Wife: Labor hurts. I’m crazy and stupid; I don’t want to get pregnant again. This is the first and last time. If anyone had told me about that pain, I would’ve never thought about marriage. A big scream from the pregnant woman calls for the baby to come out and get introduced into this world to join the mother’s community. Wife: Honey, what is the gender of the baby? Husband: What? The baby is a girl. We knew that a long time ago. Wife: Yipeeee… I thought the doctor would change her mind. Is she pretty? He: (Teasing her) Who, the doctor? Yes, very. Wife: No, silly! I mean the baby. Husband: Oh! yes, she’s very, very pretty. Wife: OK, next time we’ll have a baby boy. Now tell them I want to hold her. Husband: (in amazement) Next time? You just said … You were … What happened? Women! Women! Women! Husbands, don’t worry. Pregnant women are all like that — in a state of confusion and amazement. And they will continue to be like that until the last second of their lives. Congratulations!